Find the fit that's right for you. Gumleaf USA Wellies are handmade in Europe. As a result, the boots are marked with European Sizing. 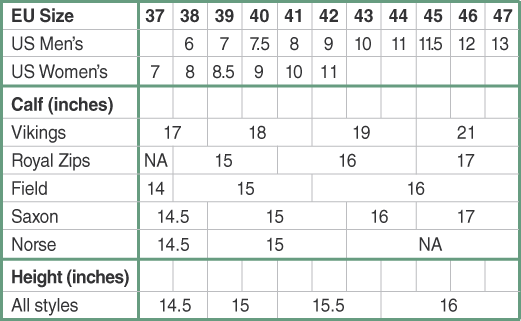 When ordering your preferred Gumleaf Welly, you’ll note that we have already converted all sizing to US shoe sizes. The below table is for your reference concerning the size conversions. Due to the 4mm neoprene sock that lines many of our Wellies combined with the stitched-in sole, thick socks are generally not needed in most conditions. Our cotton-lined boots feature a neoprene sole for cushioning and warmth. Please note the calf circumference as listed on the chart above prior to placing an order. The Viking style is designed specifically for wider calves.